A Night at the Football. Samarkand. Seeing as the Brazil World Cup tournament has just kicked off, I thought it was timely to post this Football influenced blog. I am not a huge fan of the game regarding it as more of an opportunity for 90 minutes of philosophical reflection, in between fleeting moments of excitement on the pitch. 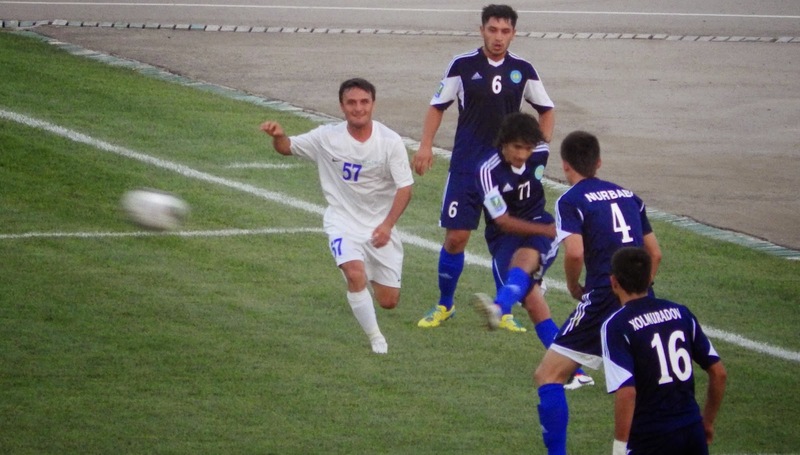 So how did I end up at the Division One clash between Samarkand and Kyzl Kum? I was shopping for bottled water in a tiny shop hidden in one of the myriad of lane ways in old Samarkand when I was asked where I was from. "Australia" I replied, which caused the young Uzbeki shopkeeper to reel off the names of the entire Australian Football team, only one of which I recognised. He was a huge Football fan and invited me to the match that evening. I had planned on a quiet night writing up my blog after a hot day of exploring Afrosiab, the ancient city pre-dating Samarkand, but as I was a convert to the art of saying yes to everything (see this blog for more information) how could I refuse. Returning to the shop at 6:00PM I met up with Mansur and two of his friends, dressed in the blue and white colours of the home team. We walked most of the way to the stadium, and saw the modern suburbs of Samarkand that tourists would rarely visit. All Soviet style grey apartments, on grey unmemorable streets, such a contrast to the colours and vibrancy of the buildings of old Samarkand. The Police presence was extreme, either they feared violence from a large mass of people, or wanted to see the popular game for free. I paid my 3000 SOM (about US$1.25) and entered the large stadium. I was treated like a VIP, which says so much for Uzbek hospitality, shown to a great seat and was an object of great interest for all surrounding me, throughout the game. A tiny group of Kyzl Kum supporters, from the remote Uzbek desert province, were surrounded by police opposite us, presumably in case they caused a riot. 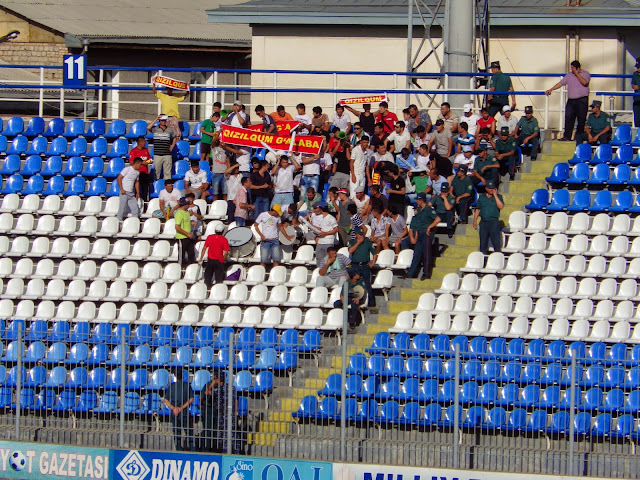 Both teams supporters were in great spirits as Dinamo Samarkand outplayed the visitors winning 1- 0. It was premier league Uzbeki style, and the antics of the Samarkand goalie kept the crowd excited when the play got dull. He would advance to the half way line, wave his arms about, and then rush back in a real hurry when the opposition attacked, a slightly more manic version of the old Liverpool goalkeeper Bruce Grobbelaar. The crowd were incredibly polite, no booing of the opposition, applauding good play, and talking and laughing during the many moments of inactivity. For all the excitement of the one goal scored by the Samarkand team, a missed clearance from a corner pounced upon by a Dinamo player in front of goal, my major memory of the match will be what happened at half time. Then the Non bread sellers appeared, pushing their converted prams, shouting out and selling their hot wares to the hungry crowd along with cups of steaming black Uzbek tea from their large thermos flasks balanced on top of the bread. Despite my protestations about not being hungry, large chunks of the fresh warm bread were pressed into my hands, along with many cups of tea, by the fans surrounding me. Possibly the friendliest bunch of Football supporters in the world.